mae is one lucky little lady. besides having wonderful, caring and ever so good looking parents (heh), she has been sent amazing and thoughtful presents from family and friends all over the world, even from bloggy friends who she is likely never to meet. 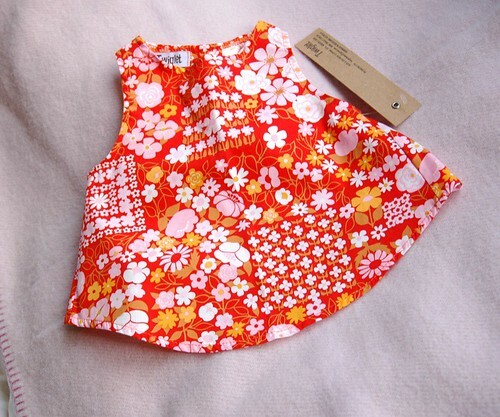 the gorgeous little frock above is a gift from dana, from her line of amazing handmade kid's clothes, twiglet. she designs such gorgeous little numbers with great fabrics, i totally have my eye on one of her resort hoodies for mae's first birthday (yes, i plan ahead). 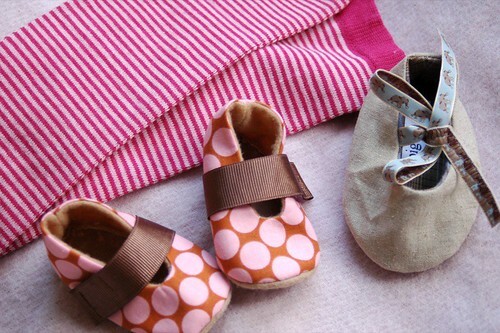 and for mae's little legs and tootsies, she was given the sweet pair of spotted booties from my buddy emily who got ordered them from this talented etsy seller. they are so sweet and fit her now so she's been sporting them a bunch lately and looking so cute doing it. when her feet get a bit bigger she can wear the lovely linen pair (there is another one somewhere in her room, really!) that christine of pigeon pair sent over for mae with a fabric swap we did. a gorgeous little thoughtful surprise that i've been meaning to post about for literally months now... finally, christine, finally! thank you. and the cozy leg warmers were another surprise that arrived last week from the beyond thoughtful leslie. she had already sent mae some amazingly cute cotton baby kimono tops before she was born so when these arrived i was almost teary with gratitude. it just blows me away that people are so thoughtful and just, well, nice, you know? my sister-in-law asked shane if i was finding it hard being at home by myself all day and he said "nope". one of the main reasons why is that i know all these wonderful people; amazing, creative, funny and kind people that i can catch up with in a quick blog post when i have a few minutes to share and who make me feel that i'm never too far from a friend. thank you, all of you who read and comment and post your own lives, thank you. oh, i hope mae loves her leg warmers! and all those other little goodies. lucky gal. 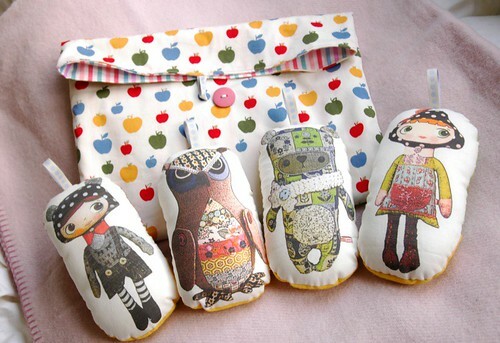 Those mini-cushies are just so cute I doubt they will ever be hidden away in the little bag they come in!! The Twiglet top is stunning! And the shoes and tights - ack, too, too cute. it is surprising the number of packages you receive from people you wouldn't expect...i just got a knitted blanket from the people that rent my parents house in Florida.. i've never ever met them, and have no idea actually who they even are. completely unexpected. Mae is going to be the best dressed baby in town. What divine gifts. oh all these goodies rock! i especially love the one red robin mini cushies! Such fun having a girl!